Rarely do moviegoers expect to feel uneasy before the lights dim and the opening titles pop up on-screen. But it’s hard not to feel a little anxious before “Tower,” Harris Theater’s last screening at the Three Rivers Film Festival on Sunday. It’s likely stuck in American moviegoers’ memory at this point — violence and mass shootings at theaters in Aurora, Colorado; Lafayette, Louisiana; and Nashville, Tennessee. Knowing you’re about to watch a documentary about one of the first widely publicized mass shootings in American history makes you at least consider these tragedies one more time, maybe even check the exits. The team behind “Tower,” a documentary about the shootings at the University of Texas in 1966, knows they’re documenting a sensitive topic. There’s little talk of the sniper, Charles Whitman — who killed 17 people from the 307-foot-tall clock tower on top of UT’s Main Building — nor graphic archival footage of slain bodies or crying families. Instead, “Tower” carefully mixes chosen archival video with rotoscope animation, meaning the director, Keith Maitland, chose to reenact most of the day with live actors then have illustrators draw over the footage and animate it. The animation allows for engaging retelling of the event while giving room to shy away from gore that a big-budget retelling might welcome. So when someone’s shot, his or her image vanishes into a white silhouette, surrounded by solid, tomato-colored red. The only blood you see in “Tower” is black-and-white footage of stains on a set of stairs, and that’s the film’s simple, most effective move. “Tower” doesn’t try to convince you of the crime’s severity, instead opting to give a beginning-to-end, interview-driven account of what happened on Aug. 1, 1966. Like the murders it depicts, “Tower” has a breathless pace, moving from interview to interview, hitting the key moments of the catastrophe while using true accounts to drive the narrative. Within the first 10 minutes, the film introduces Claire Wilson (Violett Beane), a pregnant woman who is one of the first to be shot by the sniper along with her boyfriend, Tom Eckman (Cole Bee Wilson), both landing with a thud on the sweltering concrete. Wilson lives and shares her story throughout the documentary, but Eckman and the couple’s unborn baby die almost immediately. The film also follows Houston McCoy (Blair Jackson) and Ramiro Martinez (Louie Arnette), the officers who end up raiding the tower with Allen Crum (Chris Doubek), who manages a nearby co-op. 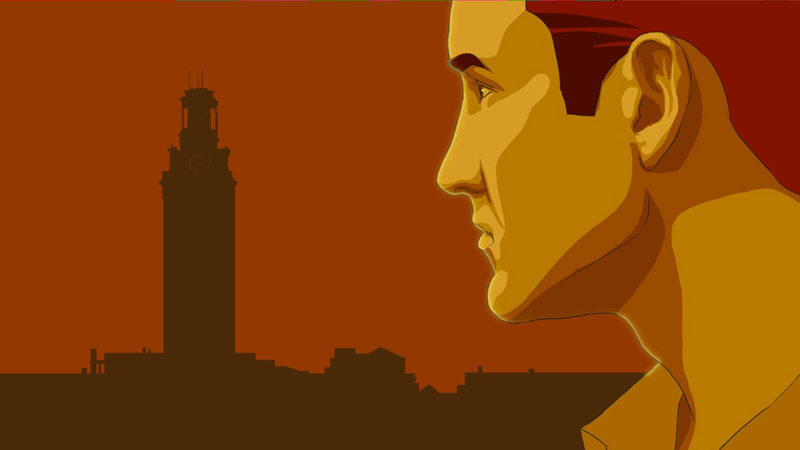 There’s several other students, journalists and professors who chime in throughout “Tower,” oftentimes with their cartoon image superimposed onto real-life footage of UT’s ’60s-era campus while they talk. Maitland slips a few time markers into the film without being too overt — “In Cold Blood” is on stands at Crum’s co-op, a student has a retro-looking Spiderman comic tucked to his side, Donovan’s acoustic, melancholy “Colours” swells in the background when Wilson recalls falling in love with Eckman. The flashback is not only one of the most visually striking scenes in the film, but it’s the best example of the effectiveness of Maitland’s animation. Whereas most of “Tower’s” drawings are in black and white — likely to show the bleakness of the day, as well as to avoid romanticizing the tragedy — Wilson’s memories explode with color. Psychedelic shades of purple, cartoon butterflies and lava lamp bubbles surround Wilson and Eckman’s love story as well as Wilson remembering how Eckman couldn’t tell if she was “chubby or pregnant” when they first met. Color in “Tower” symbolizes hope, love — silver linings if there were any to this day. While most of the interviews simply serve as basic narration, giving us an account of the shooting and its aftermath, occasionally they serve to gently ask the audience: What would you have done? One student shares, “I realized I was a coward,” when she couldn’t bring herself to run right under the sniper’s scope to save Wilson, who is constantly on the verge of death throughout “Tower,” baking under the Texas sun. Eventually, the cartoons — which depict the survivors as their younger selves, with actors reading their words verbatim — disappear, and Wilson, the policemen and others morph into their older selves. Wilson reunites with John Fox, the man who helped drag her to safety, in the present day. Wilson says that the documentary helped her find a community to help deal with the pain of losing Eckhart and her unborn baby, 50 years later. Near the end of “Tower,” you’re not only sold on the value of retelling the events at UT but on the process of making the film itself. A line from another documentary that played at the festival, “Kate Plays Christine,” relates to “Tower.” A historian tells Kate Lyn Sheil, who’s preparing for the role of Christine Chubbuck — a journalist who shot herself live on-air in 1974 — that you die twice. First, you die when the last breath escapes from your body, and then you die when someone says your name for the last time. In the context of the film, the line feels forced, like the filmmakers are making us question whether or not Chubbuck’s suicide — and Sheil’s obsession with her death — is just a narcissistic, desperate attempt to be remembered. But in “Tower,” the message is much simpler — and more powerful — than that. During the closing moments, Wilson — shown in the present day — opens the newspaper from the morning after the shooting and reads the victims’ names. The camera looks over her shoulder as she stares at their faces, printed at the top of the paper. A minute later, before the credits roll, the names appear again on a dark screen, so the audience can see for themselves. The theater is silent as everyone reads, one by one.